I recently downloaded another cigar database that offers all sorts of ways to categorize and characterize my smokes. It’s really quite impressive. And I’d be quite impressed by anyone who filled one out and kept it up to date. Even as I was opening the program for the first time, I knew I never would use it. Oh, I’d like to. I think the information would be great to have. But the most I can muster is a half-hearted effort to write down the purchase date on a label and stick it to the cellophane. Even with that simple task, I’m probably just above the Mendoza line. I got some insight into my “I’m such a dismal failure at properly indexing my cigars” condition last night when I pulled a Dominican Montecristo from my humidor. (It looked like a Robusto; I, of course, had recorded no information on that.) This was one to which I had affixed a date: May 2006. As I picked it up and admired the lovely brown wrapper, I began to wonder what a year in the box had wrought, so I took it out to the deck and lit up. I thoroughly enjoyed it. It burned slowly and absolutely straight. The smoke was luscious, the tastes varying throughout. Was it better than a Montecristo fresh from the box? Or one with six months – or two years – aging? To be honest, I don’t know. When I started smoking cigars, I took fairly extensive notes on each one that I smoked. Perhaps if I dug those little notebooks out I’d find a page or so on a Monte that I might be able to compare to that recent one. But I’ve realized I’m not really interested in keeping all those records because, frankly, it seems just a little too much like work. Don’t get me wrong. I’m fascinated by such topics and will read and listen to other people’s cigar experiences almost endlessly. 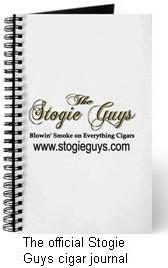 And when I’m reviewing cigars for StogieGuys.com, I do take careful notes. When I’m just smoking for myself, though, I’d rather simply concentrate on that. The only records I maintain these days — and rather halfheartedly at that — are two expanding lists: favorites and those I want to try. How about you? What sort of records, if any, do you keep? Are there diligent recorders of database data among our readers, or smokers as lackadaisical as I? I've been looking for a new Cigar Database to download. Is there anyway you could let us know which one you downloaded? I've tried Cigar Briefcase, but its a little long in the tooth. I keep pretty extensive notes in my head — and then forget everything when I get drunk. That's why I rely so heavily on Stogie Guys cigar reviews. Cigar databases and spreadsheets? No wonder you had a tough time keeping them up to date. Sounds like a full time desk job to me! For a while I did keep a rough notebook full of incoherent ramblings on my cigars, but I found that to be pretty useless. Like Don said, excellent websites like yours do a great job of keeping this data for me. Why do all the work when someone else will do it for you for free? Thanks for the info George. I appreciate it. This makes smoking cigars seem like work. I might label some choice cigars like an Opus X or some Cubans with a year they were purchased, but for the most part I just smoke them. I really don't keep anything around long enough to age it, unless you count those Thompson's someone gifted me a couple years ago that I can't bring myself to smoke. While I appreciate the studious approach to cigar smoking, I find that I just don't have the attention span to write down what I've smoked and liked. I do make mental notes – usually based upon the bands (which my girlfriend saves in a jar). That said, it's always a pleasure to come here to read what's worth smoking and what isn't. I don't really keep detailed info on my inventory of smokes. I know generally when I purchased them and that's good enough for me. I used to keep a written journal with my thoughts on the cigars I smoked, but my blog kind of replaced that. I never wrote about every cigar when I was using pen and paper, and I don't write up every cigar I smoke now on the blog. Although I enjoy doing the write-ups, I also enjoy just kicking back and enjoying a cigar with no distractions including note taking. I make a point to keep this pleasure a pleasure and not turn it into work.